Supremesoft Downtime Monitoring System (SDMS) is designed to help plant personnel to increase plant efficiency, identify problem production areas, locate hidden inefficiencies of the plant, and to optimize the maintenance intervals. SDMS provides automated downtime tracking and efficiency data collection functions in real time. The real time monitoring feature of SDMS enables plant personnel to determine the root cause of production problems in a timely and efficient manner, and provide immediate response to downtime events. With the real time efficiency reports, plant personnel will be able to analyze the Overall Equipment Effectiveness (OEE) of the current operation and increase the utilization of existing assets. The web based reporting system of SDMS enables staff from plant operation to access reports from the shop floor, and also allows management to view up-to-the-minute plant efficiency reports directly on their desktop or wireless devices. The SDMS technology is based on Supremesoft's flagship platform (SPCS) which is production-proven in the most demanding flexible manufacturing environment. The design of SDMS allows users to create downtime event definitions without any custom programming or PLC ladder program modifications. All the downtime events are captured directly from the shop floor devices which eliminates the cost of manual data collection and improves the accuracy of the data. 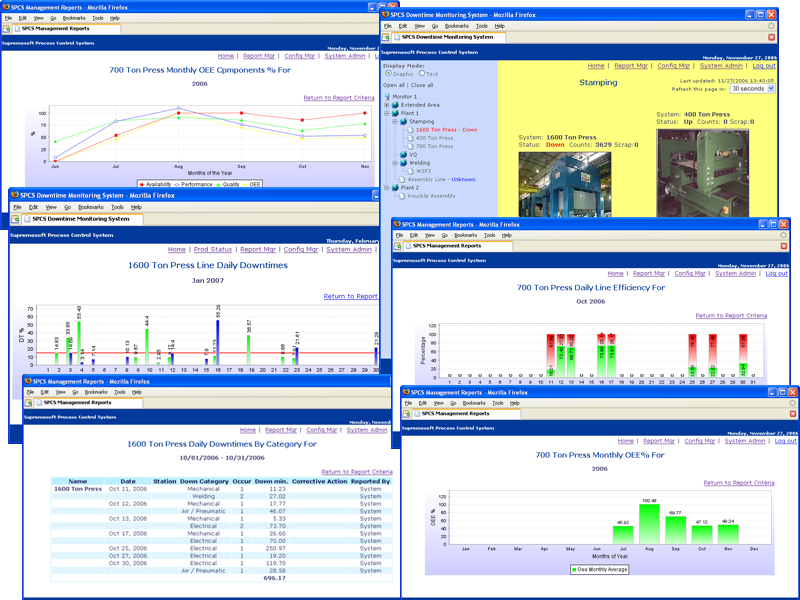 SDMS provides a rich set of web based reports for the users to analyze and compare the effectiveness, availability and reliability of equipment. Records downtime event accurately and eliminates manual data collection cost ! The Downtime Manager is the core engine of SDMS: it continuously detects and archives downtime events and efficiency data. It also performs all efficiency calculations, such as the OEE, and evaluates all the downtime rules and conditions. Provides a web based user interface for the user to view and analyze downtime and efficiency reports in real time across the enterprise. The Configuration Manager enables users to define the logical organization of the plant. An easy to use web interface guides users to setup the downtime event rules and conditions. Device Manager is a core component of SPCS, interfaces with all shop floor devices thru Ethernet and serial communication. Data Access Manager is a core component of SPCS, interfaces with a relational database management system for downtime events and configuration storage. The SPCS is designed to integrate the production and enterprise environments with maximum reliability and flexibility. The SPCS foundation provides the middleware between the manufacturing systems and the operating needs of the plant: Performance Monitoring, Data Collection and Reporting, Communications to front and Back Office, Process and Device Control and is an Excellent Foundation for Application Development and Deployment.